If you are passionate about what you do all day everyday with and for kids, it is easy to feel constant pressure and stress; however, now feels different. Today’s external demands and expectations can feel importunate, at times. It can be easy to feel overwhelmed as your to-do list grows while you’re continually sidetracked by unexpected demands for your attention. 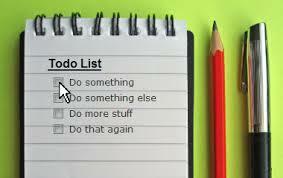 If this describes you or someone you know, perhaps the following suggestion may help: accomplish more, better, by minimizing your to-do list. Look at your to-do list and ask, “What are the things on here that can only be accomplished by me?” That becomes your to-do list, and everything else gets delegated. You know who can handle what. When those tasks are delegated appropriately, they will be done promptly and efficiently. You may even find they’re done better than you would have done them–especially if you believe enthusiastic buy-in and positive reception by the people they’re intended for are important. You may also find a growing number of people who are capable and want to be delegated to. You are surrounded by people that want to help (and want to help you!). Whether they’re kids or adults, the people around you want to help, learn, contribute, and be an active part of the good things happening. So let them. As others see this opportunity, they, too, will become willing and active contributors you can confidently delegate to. Now, you not only have more time to dedicate to the “only me” tasks, but can do so with less hanging over your head. 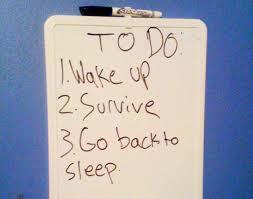 Your new to-do list is limited to only these tasks. You may find it to be just a handful of big “only me” tasks, which you now have more time to offer your attention. And who knows, with more time to dedicate to accomplishing and reflecting on these “only me” tasks, you may find another task or two in there that can be delegated. Administrators, if you have subordinate administrators you can delegate to, please do so. You know which ones you can confidently delegate to, and when others perceive this style as the norm and witness the opportunity to help, learn, contribute, and be an active part of the good things happening, they, too, will step up. The first example can be done entirely in the absence of kids from start to finish; however, not a single phase of the second example can be done without kids. This is the difference between teaching and learning–and perhaps a post for another day. The point is, by delegating to the capable people around you, your to-do list is efficiently minimized. In the first example, the teacher must determine every aspect of the lesson. Subconsciously or not, this can lead to a self-imposed pressure to “stay on track”, which can minimize differentiation, at times. The teacher has to determine expectations, memorize the lecture, make sure all students write down “the right” things, run off copies of the worksheets, and robotically grade them. In the second example, the teacher is an active learner in every phase, making differentiation and best practice along the way applicable natural reactions, from planning to assessment, and every point in between. You know which kids can handle which tasks, and when delegated the right way, you’ll find many more kids can–and want to–handle much more than you may have originally thought. Although I’ve only addressed admin, teachers, and kids, don’t forget about parents and community contacts. 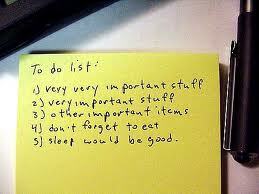 From big tasks to daily routines, by taming your to-do list you can accomplish more, better. In doing so, you may find yourself progressing from a “Proficient” educator to an “Excellent” educator. But when you do, please don’t do it for your evaluation; do it for our kids. Posted by Sam LeDeaux on January 2, 2014 in Collaboration, Education, Evaluation, Leadership, Organization, Prioritizing, Student, Teacher, Teamwork, Uncategorized and tagged Collaboration, Education, Evaluation, Leadership, Organization, Prioritizing, Student, Teacher, Teamwork, To Do Lists. Great advice! I am a continuation high school teacher and we constantly strive to have student- centered instruction. It is my personal goal to make sure every single student has spoken, written, and read at least once a day before they leave my classroom.